Unlike Democrats on November 8, 2016, Republicans partied during the 2018 midterms. Sure we would have loved to have kept the House, but we kept the Senate, lots of key governorships, state legislatures, and our AGENDA! As for Democrats controlling the House, I warn them: be careful what you wish for. I attended a midterm “watch” party. It was like a Super Bowl, only no kneelers. Everybody there was a staunch Conservative. We were festive, content with whatever the outcome. Sadly, we kept the TV channel on Fox News who looked more like CNN-lite, than it did anything resembling what Roger Ailes built. And though Fox called the House for the Democrats with only +2, we all remained undaunted. There would be no crybabies at this party or anywhere else for that matter. It was the only the 5th time in 105 years that a new administration held the Senate. What an achievement. And when you consider how pervasive Progressive idiots have become, to win key governors’ races is astounding. In midterm election races across America, Republicans pummelled their opponents, capturing the House of Representatives and a fistful of Senate seats. With some seats still to be counted, the Republicans picked up at least 60 House seats, eclipsing their 54 gains in 1994 and the party’s best result since 1938. They also gained at least six Senate seats, falling short of the 10 they needed to gain control of the upper house. It turned out that Obama lost 63 House seats. The Republicans’ 63-seat pickup in the House to take control of that chamber,won their greatest number of House seats since 1946. Trump lost 26 House seats. However, he gained in the Senate, joining select presidential company. And Trump’s Herculean accomplishments occurred as Democrats attacked everything he has done. The loss of the House is the first major setback Obama has faced in his relatively untroubled political rise from a community worker in Chicago to the presidency, and means that Nancy Pelosi – its first female Speaker – will give way to the Republican John Boehner. President Obama’s controversial stimulus and Obamacare are the main reasons the Democrats got crushed. Along with the devastation in the House and Senate in 2010, Republicans also took control of 29 of the 50 state governorships. Further, they gained 690 seats in state legislatures, to hold their greatest number since the 1928 elections. They far surpassed their state-legislative gains in 1994. Republicans gained control of dozens of state legislative chambers, and took control of seven more legislatures than they did after 1994, and the most since 1952. Republicans picked up control of the Alabama Legislature for the first time since Reconstruction. And if that wasn’t historic enough, Republicans also gained control of the North Carolina Senate for the first time since 1870, and control of the Minnesota Senate for the first time since the state returned to partisan elections in 1974. That’s a far cry from what they will write about the 2018 midterms. 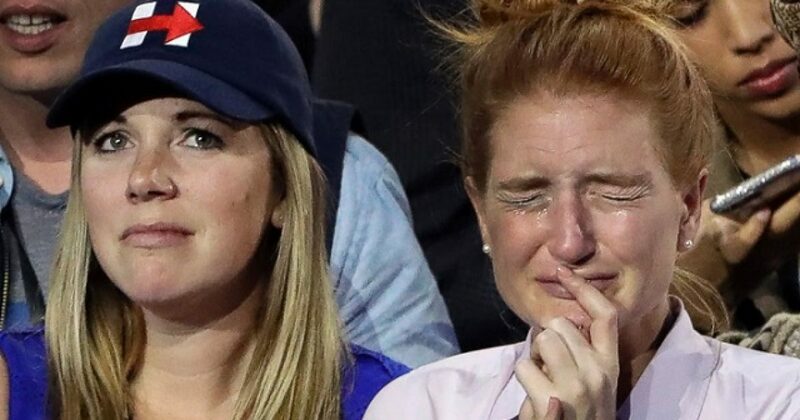 Democrats lamented on election night that the blue wave never materialized. So now Trump has two more years to dazzle America. He just needs the whisper campaign of support to end. Then for his supporters to openly and vehemently support his agenda. If we do that, Trump will cruise to victory in 2020, and Republicans will get the House back. For now, Democrats celebrate…mildly. They put on a brave front, but they wanted more. In fact, they wanted it all. The didn’t get it all. Nor did they get pictures of us crying at the end of the night. That’s not what winners do.